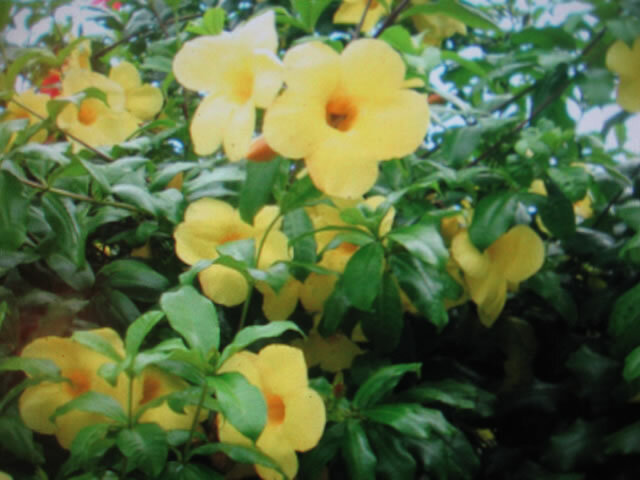 "We would like some info on fertilizing Allamanda, the flowering vine. The Golden Trumpet Vine originated in the jungles of Brazil, but is now cultivated worldwide. Unfortunately, the Golden Trumpet Vine is only hardy in USDA zones 11-12.
and moved indoors for the winter months. Golden Trumpet Vines grow best in full sun or very bright light. give it a little protection from the sun during the hottest days in the summer. Trumpet Vines prefer a rich humus soil. Because Allamanda vines are such prolific bloomers, give them a rest during the winter months, watering less, and providing no fertilizer. Around the first of April you can start feeding your plant with a half strength mix of 5-10-5 liquid fertilizer. Fertilize with this mixture every 2-3 weeks throughout the spring and summer, but start cutting back on the feeding frequency in late August, with the last feeding at the end of September. Continue watering as long as the plant is still blooming, but when flowering is done keep the plant on the dry side until spring. Golden Trumpet Vines can be propagated by softwood cuttings. Prune back hard in the spring to improve the shape and encourage heavy flowering. Trumpet Vines are especially succeptible to damage from Spider Mites!